Wow. So disappointing, though I'm glad for your sake that you'd already visited previously. Is February an off-season of sorts in that region? That doesn't sound like the sole reason for the problems since you mentioned frustration on your other visit, but I was hoping it might be part of it. I don't want the closures to be a bad sign for the park's future, but I've read a concerning number of complaints. I love Himalaya-style rides with airtime! Those rides are hit-or-miss, ranging from dull to generically fun to amazing. I've found a few gems with mega positive G's or bucking bronco jolts. I visited on a Tuesday towards the end of January, so I don't think it was their peak season. However, from my visit last year and reports I've seen from others, it seems like this is a possibility anytime at La Feria (and has for quite some time). It's a shame because their mix of rides is quite weird. The lone saving grace of the coasters being closed is that I could try some new flats like that Himalaya. I can't decide which style I prefer- this one with the airtime or the ones that swing beyond horizontal. Imagine a place with a flume that passes through an aquarium and a sky ride that passes over animal exhibits. 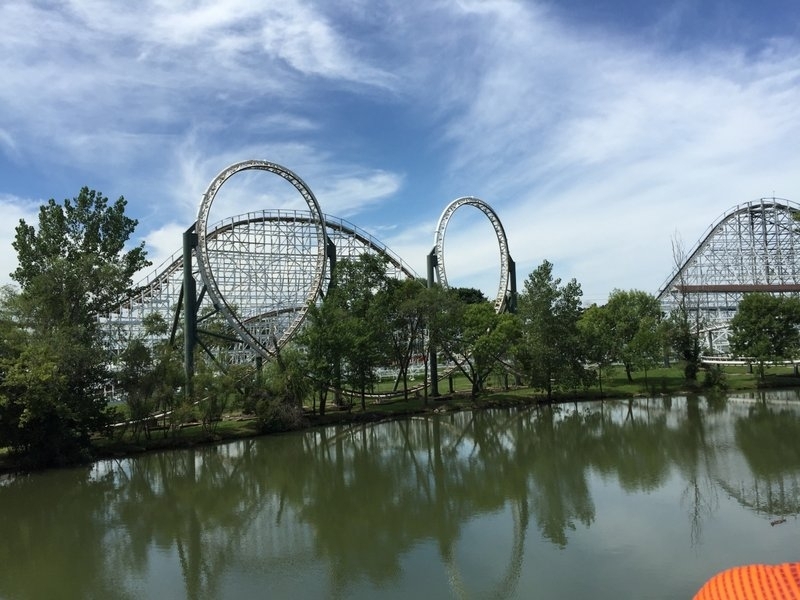 Does this sound like coasterbill’s version of heaven? All that’s missing is beer and wouldn’t you know it, they have a local BBQ littered with local beers. This place may sound too good to be true, but it exists, and it’s known as Wildlife World. I had a 7 hour layover in Phoenix. My original plan was to grab a nice dinner and spend the rest of the time at Castles n’ Coasters, but something caught my eye. It was a custom Chance family coaster only 45 minutes west of my position. I knew absolutely nothing about Wildlife World outside of the coaster, so I figured it’d be a quick credit stop and nothing else. Boy was I wrong. This is the best zoo I’ve visited outside of the Kolmarden Zoo where Wildfire is basically the ultimate cheat code. You'd hear a lot more about this place if it were anywhere but Phoenix. My first stop was the Log Flume. I love my highly themed log flumes like Splash Mountain and Ripsaw Falls that take me past animatronics. This log flume did something even crazier. The ride takes you on a safari. First and foremost, the flume surrounds an island of monkeys. That alone basically makes this ride perfection. But the flume does not stop there. You also pass through an aquarium and an aviary. I felt like I saw the entire zoo with this one ride. It does usual flume things dropping and splashing. But what other flume takes you past an island of living monkeys? The ride is literally a safari. One “ride” consists of two laps. In between laps, the operator stops the train and allows you to change seats. The coaster uses the same trains on the Chance Big Dipper coasters many of us have embarrassingly ridden, but this is considerably taller. And the pre-lift passes an alligator exhibit for good measure. The coaster is located in Adventureland (awesome sign) way in the back. It isn't much, but there's one legit moment of airtime. Now this is how a lazy man sees a zoo. Note the limited fencing. That's a theme at this park. It's Jackie Legs! And if you get that reference, I'm sorry that you too lost 90 minutes of your time watching that film. If Sky Rides aren't your thing, they offer a Safari Train instead. But Wildlife World is so much more than just rides. Obviously there are animal exhibits, but I was surprised just how minimal the fencing was around the exhibits. This was like the Mt. Olympus of animal enclosures. Most fences were about waist high and some exhibits didn’t even have fences. The result is an amazing animal experience until someone someday inevitably ruins it for everyone else. My favorite exhibit was that of the giraffes. Several parks offer an upcharge experience where you can feed a giraffe and who knows how much that even costs. At Wildlife World, you only need to pay 25 cents for food and then you can walk right onto a feeding deck for absolutely no cost. This is an absolute steal for 25 cents. It'll only take one idiot to scale this fence and ruin it for everyone. Sad but true. I'm glad they listened to me and held still for the photo. That's one creepy looking crab. This is the second of three places to have penguins on my trip. What I expected to only be a 30 minute pit stop turned into an incredible 2 hours. I almost had to cut out Castles n’ Coasters because I was enjoying Wildlife World so much. I know I didn’t see everything, but I can confidently say that this is an absolute must for an animal lover. If you plan to visit Wildlife World, there are three logistical items you should know. 1) All rides are an additional upcharge ($5-6 per) on top of the $40 entry fee. For the amount of rides they offer, I’m surprised they don’t have an all-inclusive wristband, but that’s just how it is. 2) All of the rides are cash only. I don’t recall seeing an ATM. That’s not to say there isn’t one, but I’d recommend bringing plenty of singles just to be safe. 3) The rides close well before the park does. On the day I visited, they closed about 2 hours before the rest of the park. I have no clue when I’ll ever be in Phoenix again. But I know I will again someday en route to Mexico for work. When that happens, I know I’ll find myself back at Wildlife World. This looks like a neat little place. Tons of places have that obligatory kiddie credit. It's always nice when they opt for something a bit more on the family side. The flume also looks really unique! A bit pricey but certainly unique. It definitely was pricey, but when in Rome (or Phoenix in this case). It definitely had enough for a full day though and I certainly can hope they eventually roll out an all-inclusive pass. When it comes to airports, I like to play it conservative. I strictly adhere to the 2 hours for domestic and 3 hours for international flights. Now I know a lot of people who ignore that recommendation and make it through just fine, but that’s not my preference. I originally planned to be there from 5-5:45, which would give me plenty of time to make my 9 pm flight to Edmonton. But because I enjoyed Wildlife World far more than expected, I didn’t end up leaving that park until 5 and Castles n’ Coasters was 45 minutes away. Did I do the responsible thing? Probably not. But did I do the fun thing? Absolutely! Castles n' Coasters was light on the castles, but heavy on the mini golf. As expected, crowds weren’t an issue. However, finding the ticket booth was. You’d think the giant sign underneath the castle that says “Ticket Booth” would be the right place, but you’d be wrong. I was redirected into the impressive looking arcade to the prize redemption counter. If I had more time, a visit down Pinball Alley would have been in order. My first stop was Desert Storm. If I was only going to ride one thing, it sure as heck was going to be the effed up Hopkins looper. Because of its location, you never really hear much about Desert Storm. But I was intrigued by it. The loading procedure was painful. The lone employee sat by the control panel with a timer before sending out a train. My watch timed the average dispatch at about 7 minutes. That’s frustrating on a normal day, but especially when you have a flight in a few hours. In many ways, Desert Storm rode like a drunken Schwarzkopf. The first drop had some vicious, throw-you-over the seat divider laterals. And that was followed by a circular vertical loop that pulled enough Gs to almost make me kiss my own knees. But it’s the second loop that’s the true WTF. It starts like your normal vertical loop, but then it curves sideways almost like a corkscrew. The end result is an element with as many Gs as the first loop and the crazy laterals of the first drop. The following helix is slow, but quite dizzying probably because that second loop destroyed my equilibrium. Hopkins, were you drinking when you designed this loop? Don't lie to me. Desert Storm passes over all sorts of rides and pathways. After my second ride, I contemplated leaving. But then a notification popped up on my phone that WestJet had a flight delay! I anxiously opened it up…and it was for all of 10 minutes. But I sure as heck was going to use those 10 minutes. 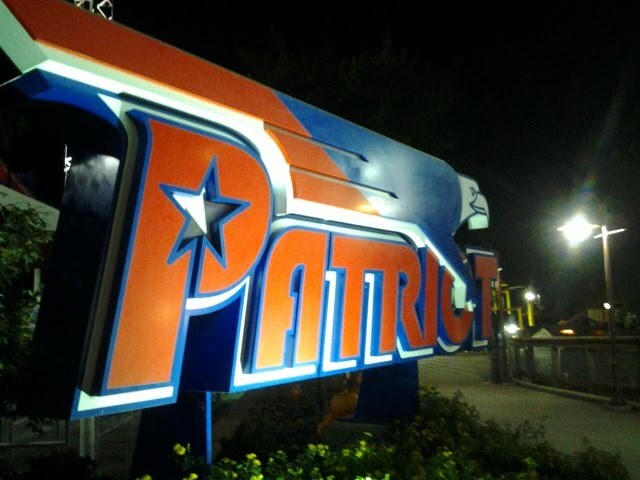 My next stop was the junior coaster in Patriot. I have no clue if the Cardinals will ever face the Patriots in the Super Bowl, but Castles n’ Coasters is in good shape if they lose a bet with Six Flags New England. The ride itself was a bit bumpy, but the final helix was extremely tight and actually pulled some Gs. Riding this credit is part of the TB12 method. This thing sounded like death, but it rode like a dream. I always thought Castles n’ Coasters had one of those standard portable flumes, but they actually had a neat looking custom one with some pirate theming and a tunnel. I didn’t want to arrive at the airport dripping wet, but Splashdown was worth the gamble. What a surprisingly nice flume! Since I needed to pass Desert Storm on the way out, I couldn’t help myself and took one final ride in the back. To experience the screwy laterals in full, that is the place to ride this coaster. I ended up back in the parking lot around 6:30 and comfortably made my flight. Security had no line whatsoever and I even had enough time for a full sit-down dinner. Castles n’ Coasters is a neat little park and I wish I had more time there. It’s not a park worth traveling to exclusively, but if you’re travels take you through Phoenix, it’s absolutely worth a stop. Yeah, Wildlife World looks amazing. Great report. Thanks! I know you'll be making a trip out there someday since your good friends Frontier and Allegiant service the area. Nice. Allegiant flies from Springfield to Mesa for super cheap, but I've never felt a reason to go to Phoenix. Looks like a fun little park though, I may have to get out to the desert eventually. Beyond the parks, I thought the mountain backdrops of Arizona were quite impressive as I was driving down the highway. It was a really nice place to spend a layover.